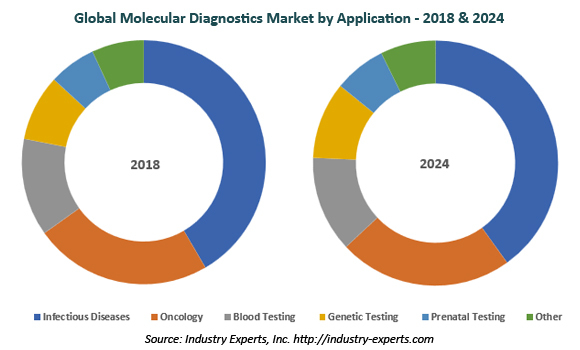 Growing Prevalence of Genetic Disorders and Growth Driven by Hospitals & Diagnostic Labs, Global Molecular Diagnostics Market is projected to Touch $20 Billion by 2024 – Market Report (2017-2024) by Industry Experts, Inc.
Industry Experts, Inc. published the new market research report “Global Molecular Diagnostics Market – Technologies, Products, Applications and End-Use Sectors“. Analysts at Industry Experts reveal that the reagents & consumables market is largest amongst the molecular diagnostics product types in 2018 estimated at US$7.1 billion. Emergence of novel next generation sequencing technologies, extensive use of next generation sequencing technologies in clinical diagnostics, application of sequencing technologies in cancer to detect mutations are some of the factors fueling the growth of sequencing technologies usage in the molecular diagnostics field. Growing prevalence of genetic disorders, rising demand for personalized medicine etc., are some of the factors attributed to the fastest growth nature of molecular diagnostics applications in Genetic testing. The market for Molecular Diagnostics applications analyzed in this study includes Infectious Diseases, Oncology, Blood Testing, Genetic Testing, Prenatal Testing and Others containing Agriculture, Veterinary, Dairy etc. Global market for Molecular Diagnostics is dominated by Infectious Diseases, estimated at US$3.9 billion in 2018 and is anticipated to post a CAGR of 11.9% between 2018 and 2024 and reach a projected US$7.7 billion by 2024. Molecular Diagnostics technologies market explored in this report includes PCR Polymerase Chain Reaction (PCR), Sequencing, Hybridization and Others comprising Microarrays, Nanotechnology etc. The study includes the market analysis for Molecular Diagnostics product types – Reagents and Consumables, Instruments and Software & Services. The study also explores the market analysis for Molecular Diagnostics End-Use sectors comprising Hospitals & Diagnostics Labs, Research Institutes & Universities and Others including Blood Banks, Nursing Homes, Local Public Health Laboratories, point of Care settings etc. The report reviews, analyses and projects the Molecular Diagnostics market for global and the regional markets including the North America, Europe, Asia-Pacific and Rest of World for the period 2015-2024 in terms of value in USD. These regional markets further analyzed for 15 independent countries across North America – the United States, Canada and Mexico; Europe – Germany, France, The United Kingdom, Italy and Spain; Asia-Pacific –China, Japan, India and South Korea and Rest of World – Brazil, Argentina and Israel. This 526 page Molecular Diagnostics market report includes 381 charts (includes a data table and graphical representation for each table), supported with a meaningful and easy to understand graphical presentation, of the market. The statistical tables represent the data for the global market by geographic region, technology, product type, application and end-use sector. This report includes the brief business profiles of 36 key global players and 48 major players across the North America – 30; Europe – 12; Asia-Pacific – 5; and Rest of World – 1. The report also provides the listing of the companies engaged in research & development, manufacturing and supply of Molecular Diagnostics. The global list of companies covers addresses, contact numbers and the website addresses of 169 companies.